The UN special rapporteur on the rights of indigenous people says the Canadian government has repeatedly failed to stop decades of violence against First Nations women, and has called for a national inquiry. Victoria Tauli-Corpuz said the Canadian government had taken some steps to protect aboriginal women, including funding 30 organizations with the aim of reducing violence against them, but that more must be done. “That’s not enough. That’s not an adequate response,” she told The Guardian in New York. The UN has been demanding that Canada hold an inquiry into violence against indigenous women for seven years. According to a report by the Royal Canadian Police released last year, violence against native women claimed 1,017 victims between 1980 and 2012, and 164 are still missing. Their plight was highlighted by the case of Cindy Gladue. She was stabbed by a trucker in Edmonton in 2011 who had hired her as a prostitute. The key suspect, Bradley Barton, was found not guilty in March, which resulted in outrage among activists and a national letter-writing campaign. Despite strong evidence against Barton, the all-male, all-white jury reached their decision in just a day and a half. Under pressure, the government said it would appeal the verdict. “This is another example of the way aboriginal women in Canada are marginalized, erased and denied justice,” said activist Fawn Lamouche in a news release in March. Separate from this isolated case, indigenous groups say that institutional racism results in impunity for many of the perpetrators of violence against aboriginal women. “Their claim is that the police are so discriminatory against indigenous women, and so [the police] don’t believe that there are these kinds of things happening. They really blame it on racism, number one,” said Tauli-Corpuz. She also repeated calls by her predecessors for an official national inquiry. “There has never been any official national inquiry into the issue,” she said. 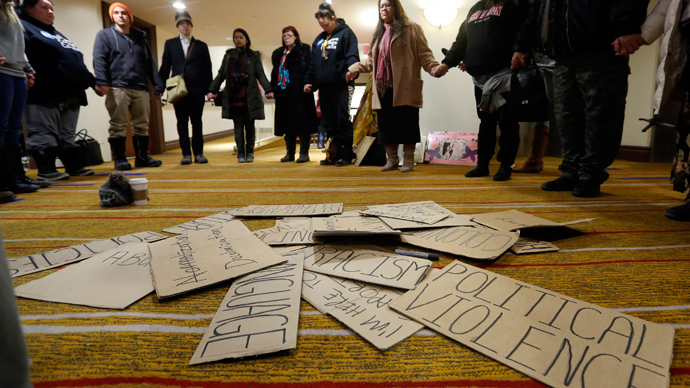 In March, the UN Committee on the Elimination of Discrimination against Women (CEDAW) found the Canadian government has committed “grave violations” against the human rights of indigenous women by not doing anything to address the problem of violence against them. CEDAW noted there were severe weaknesses in the enforcement and justice systems. Indigenous people’s leaders in Canada are urgently calling on the Canadian government to take action. “Canada’s inaction in regard to missing and murdered indigenous women is getting increasing international attention, and this latest from CEDAW calling it a ‘grave violation of human rights’ cannot be ignored,” assembly of First Nations chief, Perry Bellegarde, said in a statement in March. However, the report by the Canadian police points to the fact that the solve rates between homicides of aboriginal and non-aboriginal women are identical. Both stand at 90 percent and most female homicides regardless of race follow the same pattern. They are committed by males who in most cases knew their victim.